← Two undeniable facts in Bolivian politics?! WASHINGTON — Looking for a way to shake up your summer soirees? Singani could be the key to your success. 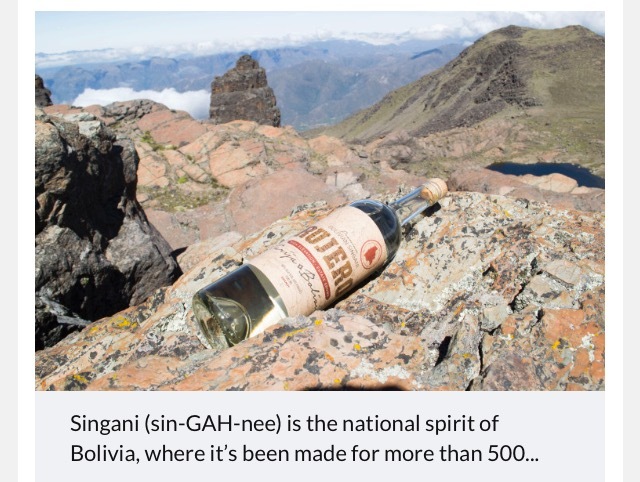 Singani (sin-GAH-nee) is the national spirit of Bolivia, where it’s been made for more than 500 years. Like pisco, singani is made from distilled grapes. And while the ingredients of the two South American spirits are similar, the flavors are distinctively different. “The most fun description we’ve heard was, ‘If a fine tequila made love to a smooth pisco on a bed of rose petals, the love child would be [singani],’” said Ramon Escobar. Now, he’s on a mission to introduce it to others. Last year, Escobar brought the singani brand Rujero to the U.S. beverage market through his company Chufly Imports. Up until that point, Escobar says it was nearly impossible to find the spirit on liquor store shelves. Now, more than 50 bars and restaurants in the D.C. area carry Rujero singani, including Dram & Grain, Jack Rose, Bourbon Steak and The Gibson. Liquor stores and ABC stores throughout the DMV also stock the spirit. Of course Rujero isn’t the only brand. Most notably, director Steven Soderbergh is also bringing his brand, Singani 63, to the U.S. The key element that makes singani unique in taste is elevation. Rujero’s vineyard, which is more than 200 years old, sits 6,900 feet above sea level. “You have more intense sun and the grape skin becomes thicker and more intense. [The elevation] changes the nature of the grape, that’s really what happens,” Escobar said. Even distillation is impacted by the elevation, since a higher altitude means a lower boiling point. “And so you’re able to retain some of the flavors, the subtle scents and aromas that normally would be burned off in the process,” said Escobar, who describes the final product as floral, aromatic and complex — a combination that makes the spirit versatile in the cocktail shaker. Most Bolivians drink singani on the rocks with lime, or with ginger ale and lime, but Escobar says it can be subbed it in for whiskey or gin in classic cocktails, or mixed with Italian sodas for a refreshing summer beverage. And the next time you mix up a margarita, Escobar says hold the tequila: singani is the perfect swap in the sour and salty drink. By growing singani’s presence, Escobar hopes to familiarize more Americans with Bolivia’s culture — one sip at a time. “I look at Rujero as a way to introduce Americans to a part of the world that most nobody knows anything about. And I think that booze, frankly, is a great way to discover a new culture, a new people. It livens the mood, right?” he said. Creating a demand in the U.S. for singani also creates hope for those living and working in one of the Western hemisphere’s poorest countries. “Bolivia’s winemaking culture — it’s history, it’s tradition — is very rich, but it’s very small, and it’s really only supported by its domestic consumption,” Escobar said. In addition to growing the drink’s presence in the D.C. area, Escobar plans to distribute his Rujero singani to New York and Philadelphia later this year. He also has his sights set on Wisconsin, Texas and Oregon. He says his goal is to see singani at every bar in the U.S., next to other niche spirits such as mezcal and pisco. “If that happens, then Bolivia’s economic future looks substantially better,” he said. This entry was posted in Bolivia, Business, Economics, Tourism and tagged Bolivians abroad, singani. Bookmark the permalink.